If you’d like a few new entrées for your 2015 menus, I have three resources that you should definitely check out. At school (and home), proteins are usually at the center of the tray or plate. With these on-trend recipes, you can please your customers and effectively manage your school food budget at the same time. It has been my pleasure to work with the American Egg Board (AEB) over the past couple of years. The Incredible Edible Egg truly is a popular, versatile, cost-effective way to add protein to any school meal. In the Eggs in Schools White Paper, I discuss these top three reasons to incorporate eggs: (1) Popular egg dishes can help increase Average Daily Participation (ADP); (2) The affordability of eggs allows more menu flexibility; and (3) Eggs provide versatile vegetarian and gluten-free options. 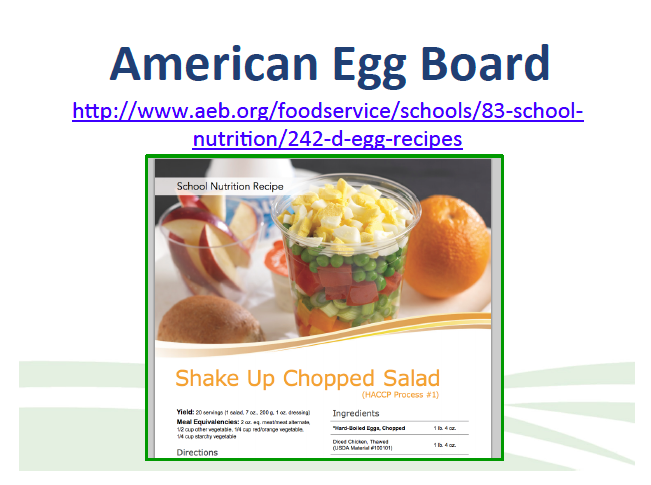 With input from hundreds of school nutrition professionals and the creativity of Malissa Marsden, AEB now offers dozens Egg Recipes for breakfast, lunch and snacks. Complete preparation instructions, meal equivalencies and nutrition analysis are provided. You can shake things up with this fun salad or power up with a Protein Box Lunch K-8. 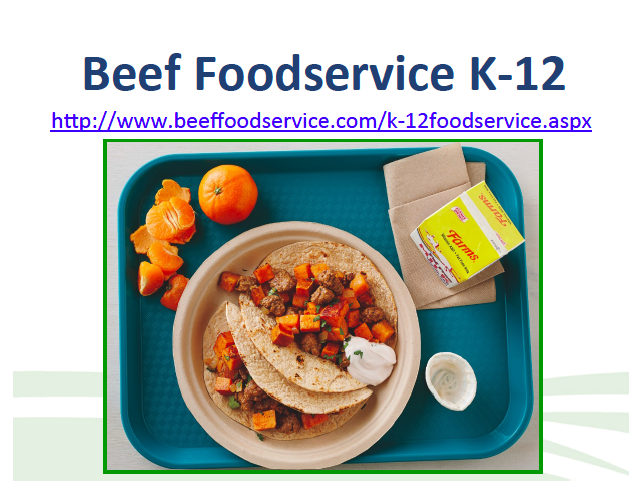 There is also plenty of protein power – along with layers of ethnic flavors – in the nutrient-rich school lunch beef recipes developed by The Beef Checkoff. To help schools include high-quality protein, like beef, on the menu, I was honored to work with team of culinary experts who developed five new beef ground recipes that can be easily incorporated into any school lunch menu. The recipes were tested by real school cooks in real kitchens with real students – and you can read their comments online. While I like all five recipes, the Sweet Potato Beef Mash-up is my personal favorite with southwest-seasoned ground beef and sweet potatoes served hash-style and topped with a mixture of plain yogurt and hot pepper sauce. It can be served in a whole wheat tortilla or in Romaine lettuce cups for gluten-free option. The final protein resource comes from the sea – from another commodity board whose product is available as a USDA Food – the Genuine Alaska Pollock Producers. From the more familiar Fish Tacos to an innovative Alaska Pollock Po’Boy, there are some delicious looking recipes on this site. I especially like the fact that they include sauces and side dishes for each of the pollock entrees. Like the other commodity groups featured, the pollock producers offer success stories and wonderful recipes that meet the meal pattern guidelines. 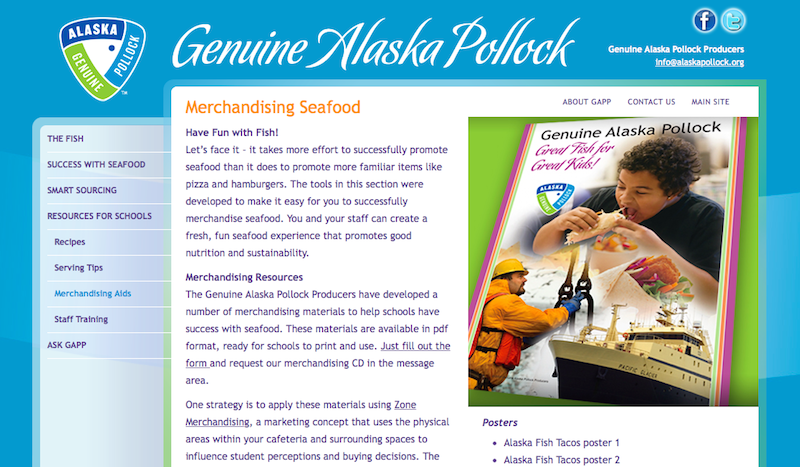 There’s nothing fishy here – just proven ways to help students enjoy the health benefits of seafood at a reasonable cost and they can help with merchandising too. Honestly, there is no reason to keep serving the same recipes cycle after cycle – with all the recipes and resources available online, it’s easy to mix-up your menus and offer new, exciting dishes to your customers! While farm to school efforts are well established for fruits and vegetables in most states, other food groups are just now gearing up for local school delivery. We know about a few fledging efforts to bring local grains to school meal programs, like grits in Burke County, Georgia, and barley in Bethel School District, Eugene, Oregon. Thanks to FoodCorps Montana, Montana beef for Montana schools is becoming a reality – and other districts are sourcing local pork and poultry. Of course, fresh milk is a local product, moving from dairy farm to school carton in as little as two days. Through innovative partnerships in a few coastal states, schools are now being able to serve fresh local fish to their customers. Students in Oyster River (NH) School District enjoyed that experience yesterday and Director Doris Demers was thrilled. The Acadian Redfish was caught by local fisherman on Wednesday morning, then 100 pounds were fileted and delivered to her schools on Wednesday afternoon by Tri-State Seafood. 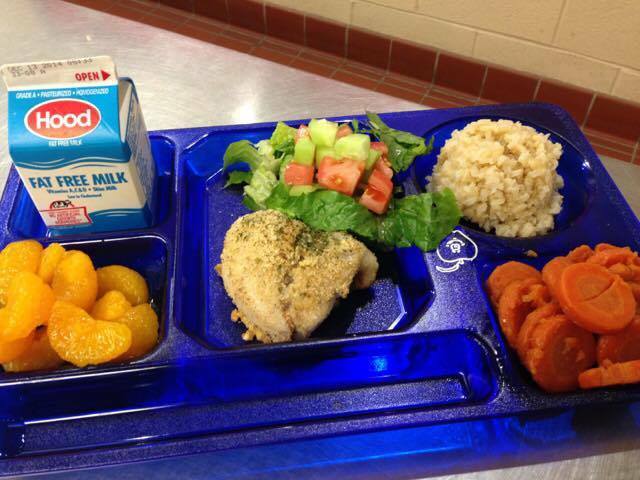 By Thursday lunch, they were on the trays of lucky students throughout the district. 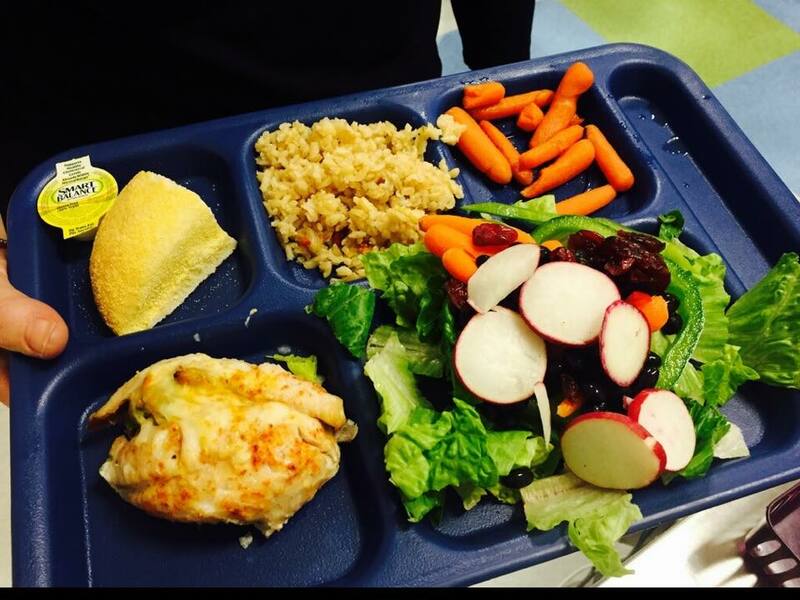 This tray from Mast Way Elementary in Lee (NH), prepared and photographed by Manager Jess, includes brown rice and carrots, as well as fruit and veggies from the daily produce bar. Each school cook had the option of preparing the fish ‘to taste’ in their kitchen, using a basic recipe with broccoli and cheese supplied by Director Demers. 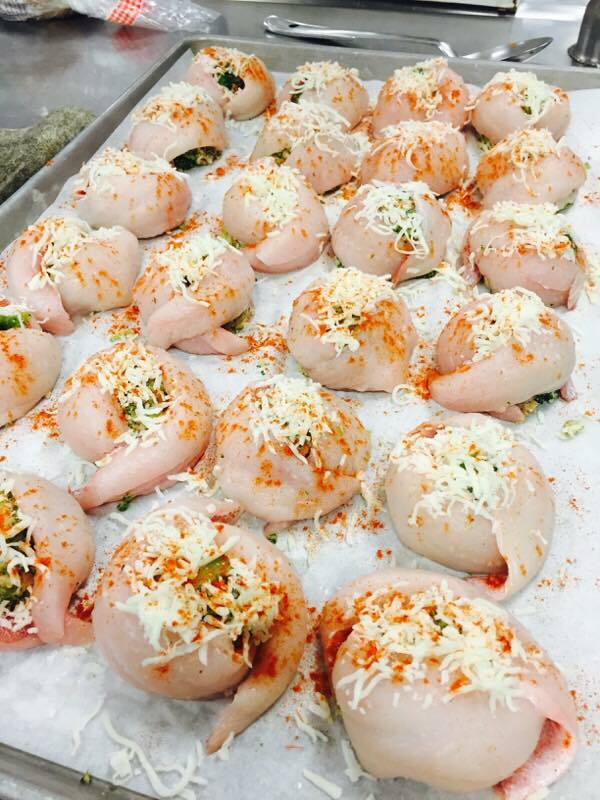 At Moharimet Elementary, Chef Michael used the broccoli as a stuffing and sprinkled the fillets with cheese before baking. 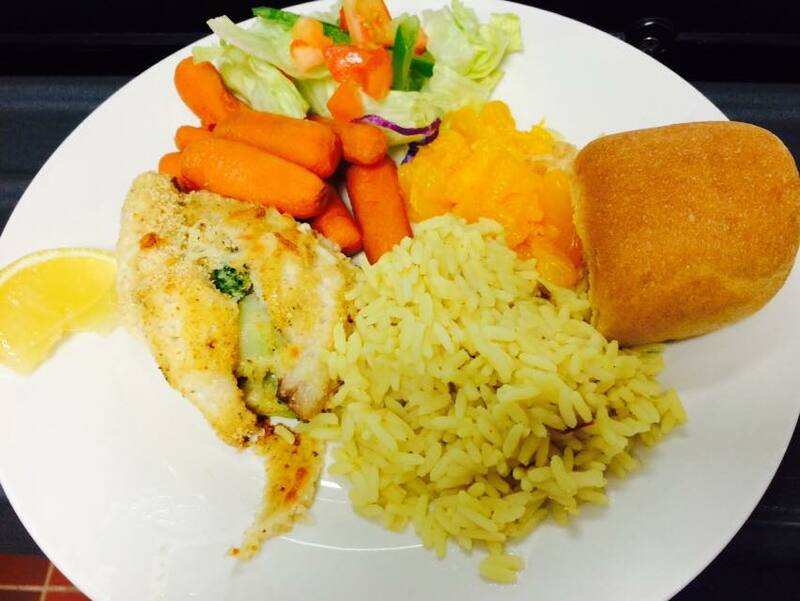 Chef’s Michael’s creation was very popular – 68 students chose the redfish hot lunch with similar side dishes to Mast Way. Teachers and families were also very positive about local fish lunches, which is a real boost to local fisherman. 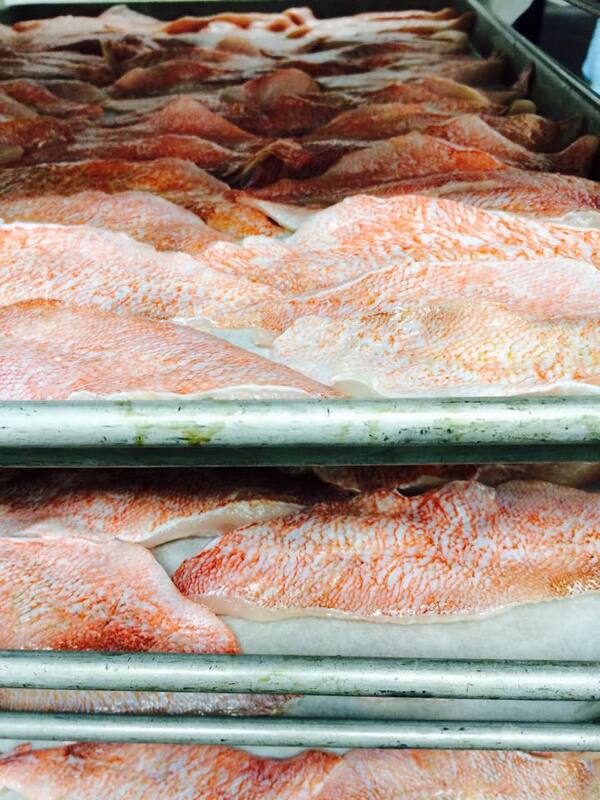 The Acadian Redfish, served in four New Hampshire district this week is a partnership with UNH Cooperative Extension. 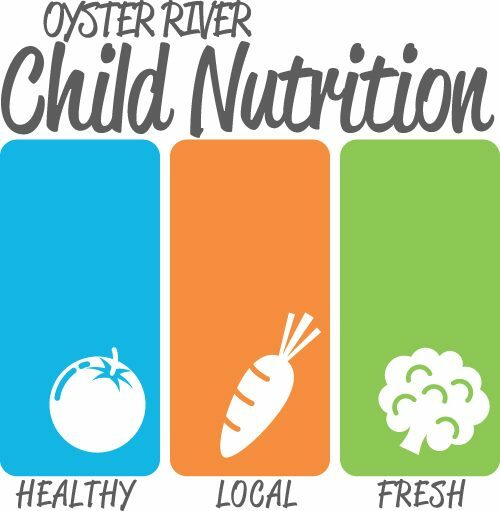 With this #RealSchoolFood lunch, Oyster River Child Nutrition joins districts in Alaska, Oregon and Massachusetts in the boat to school movement. They also live up up to their logo: HEALTHY. LOCAL. FRESH.